Hi everyone! As usual I'm back again on the last Saturday of the month with another interview featuring new embroideries with vintage patterns. 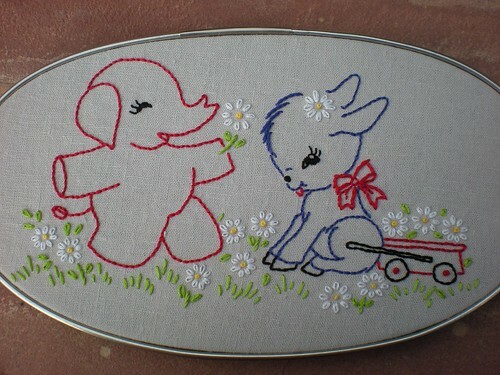 This month I am featuring 2 very generous flickr members, loves to sew and mmaammbr, who have shared tons and tons of copyright-free vintage embroidery patterns in the hoop love group (membership requires approval by the group's administrator) on flickr. And like my last interview, I am thrilled to sprinkle in new embroideries from vintage embroidery patterns that other flick members have stitched up from patterns that were shared by loves to sew and mmaambr! Hope y'all enjoy! 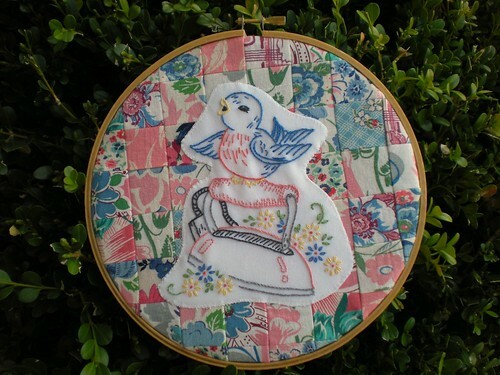 And as always, I invite you to join our New Embroidery with Vintage Patterns group. Now that our contest has ended (wrap-up info here), our monthly stitch-alongs have begun again again! The March SAL (gallery photos here of those who participated) is just about over, but you are just in time to join us for our April SAL! 1. 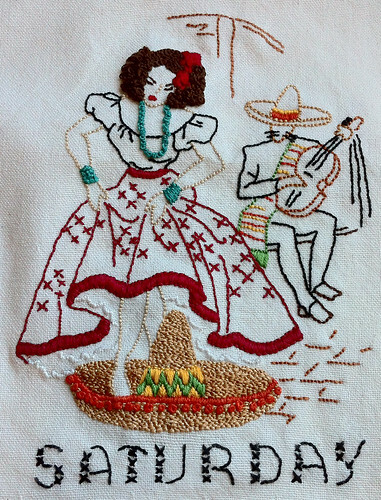 When and why did you first begin collecting vintage embroidery patterns? 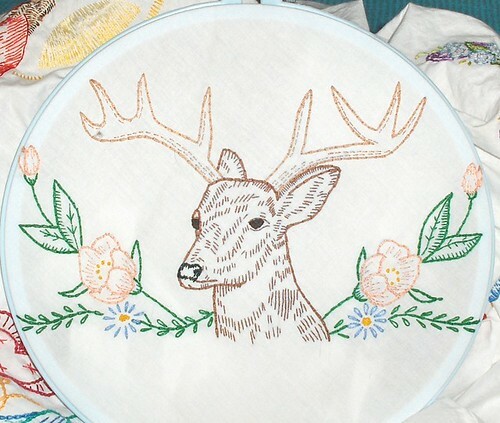 My mom started teaching me how to embroider when I was 4 years old, so I’ve always have loved embroidery designs. I started collecting them in the 1970’s. In the 1980’s, my mother-in-law gave me a box of things from Aunt Nettie and there were many old transfers in it. Most of the Walkers and Royal Society transfers that I have, came from her. 2. Do you try to seek out specific vintage embroidery patterns with certain themes or do you just collect whatever you are able to? I mainly collect patterns that I like. But I have bought patterns that I didn’t know what they were until I looked through them at home, I love the surprises I have found. 3. 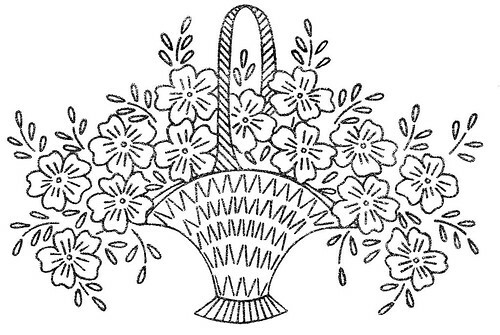 Where do you find all your vintage embroidery patterns? Estate sales? Garage sales? Ebay/etsy? Thrift stores? Another source? My mom, grandmother, Aunt Nettie and a very dear friend of mine were my main source until a couple of years ago. In the last year or so, the more resent patterns that I’ve posted I have found at Thrift stores and on Ebay. 4. Okay, let's talk about the Hoop Love Flickr group, you've generously shared over 950 copyright-free vintage patterns in this group! What motivates you to share these patterns? I love the all of the designs that are out there. The tissue (Numo) type of designs are very fragile and hard to copy, especially the large ones. I figure that a lot of patterns would end up lost if we don’t share them. 5. With all the vintage patterns in your photostream, do you have any favorites that you absolutely adore? ...there are so many to choose from it was hard to decide. 6. 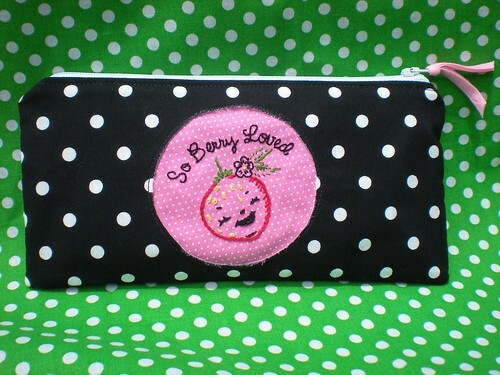 Do you collect any other vintage sewing/embroidery/craft items? I mainly collect transfers though, I do have a few vintage Barbie Doll patterns, vintage coloring books, patterns for animals and dolls and vintage crochet and knit patterns. 7. Anything else I didn't ask that you would like to share? I for one and I think a lot of us appreciate how hard you work for us. And I'd like to encourage anyone that wants to share their vintage patterns to do so. It's fun looking at new designs. There were many magazines, mostly imported from Europe, and with the Sunday’s newspapers, ‘feminine supplements’ with fashion clothes, embroidery patterns, cooking receipts, knitting, crochet and others crafts works. My grandmother and mainly my mother collected them. During the 60’s, the importation were hardly restricted on Brasil. The embroidery hot iron transfers disappeared from the Brazilian market. At the same time, the women's growing participation in the job market and the expansion of the Brazilian market economy led to the progressive abandonment of the domestic realm, of the embroidery, knitting, crochet and others craft works. The ‘feminine supplements’ disappeared too. In some families, as mine, the domestic realm, the embroidery, knitting, crochet and others craft works became a hobby to occupy the girls. 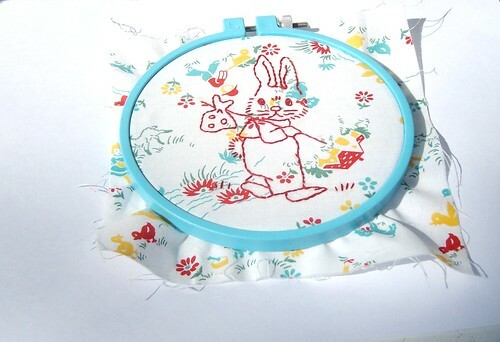 In my childhood, my grandmother and my mother did not use the embroidery patterns like hot iron transfers because they wanted to preserve the paper pattern sheets and leave them uncut. They copied them from the tissue paper and transferred them to the fabric with carbon paper. It was a pleasure to touch them or just to talk about them. Even today the embroidery patterns have the power to evoke my mother's memory. I was a teen when she began to copy them in ‘paper butter’ to preserve the drawings [because the paper they were printed out began to deteriorate. About 10 years ago I began to scan and to print up them. My mother approved but said that the copy doesn't substitute the original. Then, about five or six years ago, I began to seek them on the web. 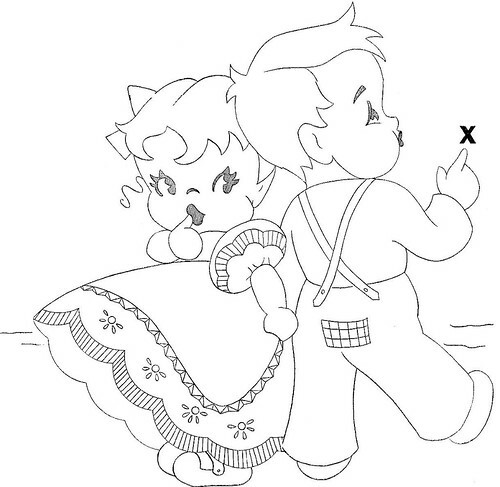 And I found Colonial Patterns, the group Hoop Love, and some sites that sell original patterns (now ‘vintage’ embroidery patterns) and others sites that sell copies, hot iron transfers or not, of vintage embroidery patterns that are in public domain. I purchase some vintage patterns in good conditions to substitute my mother’s ones that are in very poor condition or incomplete, and others (absent of my mother’s collection) that please me. The garage sales and thrift stores are not common in Brasil. On Brazilian estate sales it’s very hard to find them. I usually purchase original patterns on Colonial Patterns, on e-Bay and Etsy. 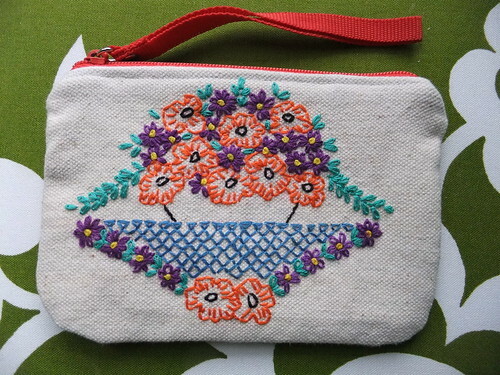 Sometimes, I purchase vintage embroidery iron-on reprints online too. I want to say that although I acquire some copies, I only scan and only share vintage embroidery patterns that me or my mother possessed the original, and of companies that stopped producing them. 4. Okay, let's talk about the Hoop Love Group, you've generously shared over 950 copyright-free vintage patterns in this group! What motivates you to share these patterns? The pleasure of sharing. The idea of creating the group is brilliant! 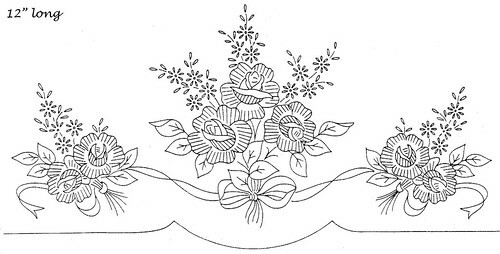 I was scanning my mother’s embroidery patterns for some time and it’s charming for me, when posting them on the Hoop Love Group, sharing with others the same happiness that other people provide for me and my mother when we found embroidery patterns that ones we know and others that we ignored until be shared on the group. 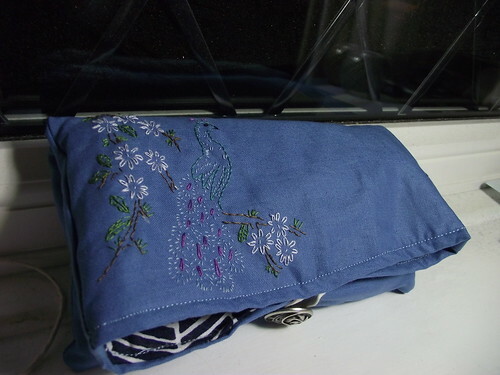 I am vastly happy when some of them inspire someone to do some manual work or learning to embroider. It’s very gratifying to see the works done with some of them. Some of them have a great meaning for me. I think Alejandro, this Mexican boy, perhaps is my first love. Freud would say that was my father, but I guess was Alejandro. No. I don’t consider me a collector, but just a person that preserves and shares the embroidery patterns that belonged to my grandmother and the ones that belonged to my mother. I've also added some of the ones they never possessed but that please me. 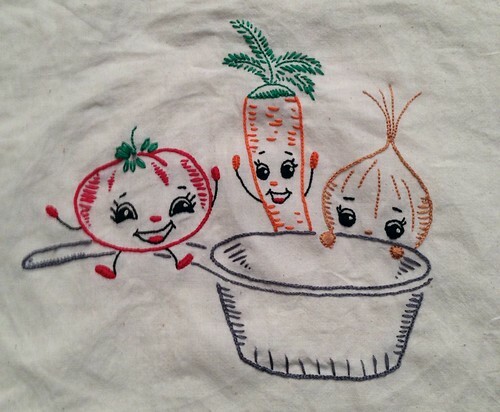 I want to thank everyone who has shared vintage embroidery patterns! These days I’m working as volunteer on Rede Feminina de Combate ao Câncer. 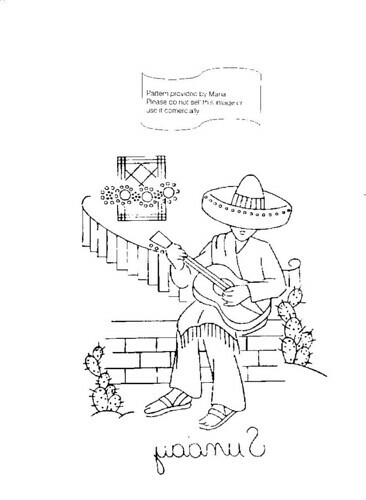 I print and bring the embroidery patterns for volunteers and our patients. You cannot imagine the therapeutic effect of looking a them and thinking about embroidery possesses! Great interview. I love the vintage patterns - they're my favorites. And, I deeply appreciate these people, who take the time and trouble to share them with us and keep them from disappearing, altogether. Thank you! Love the generosity and the time both these have made to this amazing collection of patterns on Flickr! I can't thank these two ladies enough for sharing their patterns and their love for these vintage transfers. 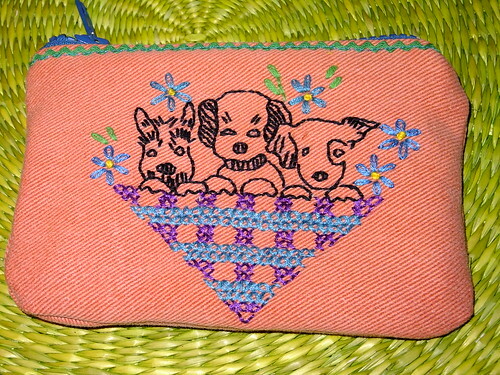 Some of my favorite stitched pieces were the result of their generosity! Love these ladies and the patterns that they have shared! These two ladies, and the other generous contributors to Hoop Love, I thank from the bottom of my heart! I also would like to thanks these wonderfully generous women for sharing so many patterns with us! I was wondering...how to you know which patterns are okay to share? I have many that I would like to share, but do not want to infringe copyright....If someone could help me out with some information, that would be great! Thanks!